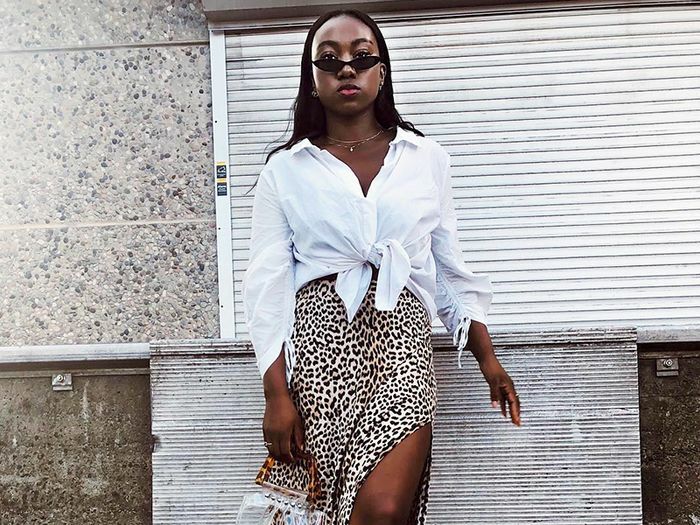 If you follow a certain set of fashion influencers, you'll know there's one item that caught on and spread like wildfire this season, quickly becoming an Instagram sensation. I'm talking, of course, about Réalisation's Naomi slip skirt. Over the course of the summer, the brand managed to sell out of the skirt on four different occasions. But the leopard skirt craze didn't stop there. Ganni stocked an equally covetable version, and before we knew it, there were affordable iterations available from & Other Stories, Pixie Market, and more. In fact, you'd be hard-pressed to find a retailer that's not partaking in the leopard skirt trend right now. I mean, if an item flooding both our Instagram feeds and shopping carts isn't the formula for going viral, I don't know what is. Actually, animal prints of all kinds (but especially leopard) account for this season's biggest trend. If you ask us, though, midi skirts are the failsafe pick to nailing the classic print once and for all. Among other benefits, they're impossibly versatile and flattering on literally everyone. Don't let me ramble on, though. Scroll down to see the epic fashion 'grams and to shop our pick of the skirt trend. Word to the wise: Don't waste any time deciding on a purchase; they're all destined to sell out very soon. The skirt that started it all. Hurry—this skirt's nearly sold-out now, too. Minimalists will flip over this sleek version. This trend couldn't be any easier to style. This has so much day-to-night potential. Snap up this affordable version before it's gone. I tend to fall in love with places like they are people. With each city I explore, a unique little piece of myself comes to the surface. Something that I might not have noticed before. Travel is magic in that sense. We can be so far from home but so close to ourselves. Paris taught me, that there is no cookie-cutter formula to confidence. Before my trip, I had this idea of the “French girl”. Created by social media, magazines, + articles. This woman was something so chic, so far removed from me, so unattainable. I came to realize from my days, sitting in cafes, walking the streets + drinking by the river: Parisian women are poised due to their remarkable knowledge + unshakeable truth to themselves. Street-style is less calculated, there is no equation of clothing that makes a woman cool. They experimented with prints + colors. Practical shoes were a must for on-the-go. And hair was natural, wherever the wind might take it. It was liberating + feminine + commanding. Their style was only a conduit to their confidence within. I am sad to leave this place. A week is never enough time for me in Europe. I will be back soon, but for now, I will try to carry that magic feeling with me back home. Au revoir, Paris. ???????? Ruching makes this one stand out. BRB—copying this entire outfit for fall. Our entire office is low-key obsessed with this pretty piece. Wear this with a black tee or sweater. Checked in at @bankhotelstockholm and have the cutest bag ever seen, I’m ready for ya #stockholmfashionweek ???????? Zara nailed it, per ususal. Now that you're equipped with the inspiration and the shopping options, go forth and make the leopard skirt trend your own!